"We are in the vineyard of Allah," Abubaker Schekau, the leader of the Nigerian Islamist terrorist organization Jama'atu Ahlis Sunna Lidda'awati wal-Jihad ("People Committed to the Propagation of the Prophet's Teachings and Jihad") has stated. Nigerian Pastor Ayo Oritsejafor, president of the Christian Association of Nigeria (CAN) representing a claimed 80 million Nigerian Christians, quoted Schekau during the second of two successive briefings last Thursday at the Rayburn House Office Building and the National Press Club. The chilling accounts of today's Nigeria facing Islamist terror by Oritsejafor and his associates gave rise to a cry for American help. The ravages of Shekau's group, commonly known by its Hausa nickname Boko Haram (BH) or "Western education is forbidden," was a central concern for Oritsejafor. He described a Nigeria in which "every week I get a text message—a church was burnt or a pastor was murdered or Christians were randomly rounded up on a roadside and summarily executed." More than 100 Christians died a month on average during 2012, amounting to about 70 percent of all Christians killed around the world that year. 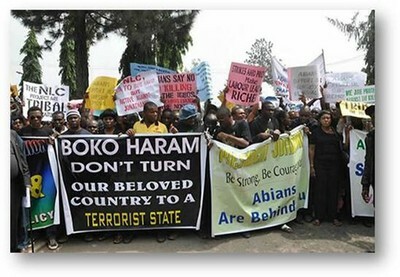 Whether by machete-wielding mobs or Vehicle-Borne Improvised Explosive Devices (VBIED) suicide bombing attacks on churches, "it is open season on Nigeria's Christians." CAN's secretary for Borno state in northeastern Nigeria, Reverend Faye Musa Pama, was one such victim on May 14. That same day, Nigerian President Goodluck Jonathan declared a state of emergency (SOE) in Borno and neighboring Yobe and Adamawa states. Oritsejafor stated that Pama's "children pleaded for his life; they refused, they killed him." Oritsejafor also received a call from another pastor in neighboring Yobe describing his imminent murder by a BH mob. "They are coming, they are shooting," the pastor said. "I couldn't do anything until they shot him," Oritsejafor recounted. "That was the end, gone." The Nigerian lawyer and human rights activist Emmanuel Ogebe, meanwhile, described a Yobe state that has "been so de-Christianized" with "entire villages run out of town." Church attendance "is down...drastically" in the Muslim-majority north, Oritsejafor noted. Nigeria's 175 million people are almost evenly split north-south between Muslims and Christians. Oritsejafor cited one congregation dropping from 500 to 13 members. In some instances, a "pastor can come and sit there alone" in church on Sunday while his family remains home because of safety concerns. Even in Nigeria's south, weekly church attendance has declined while many churches now feature metal detectors at their entrances. BH also targets modern, Westernized schools because, as Oritsejafor stated, BH terrorists "see the West as Christian." Fifty of Borno's 175 schools now lie in ruins. Fears that BH "will do more" have resulted in parents not sending their children to school. Christian girls face the further danger of abduction into coerced Muslim marriages. At the National Press Club, James Fadele, president of the Christian Association of Nigerian-Americans (CANAN), rejected State Department claims that BH resulted from an "economic and poverty crisis" rather than a "Jihadist extremist mandate." Fadele referenced the World Bank's Nigeria Economic Report released in May. Relatively calm Jigawa state reported therein a 77.5 percent poverty rate in comparison to an average 59.7 percent poverty rate for Nigeria's northeast containing the "hotbeds of Boko Haram terrorism." Oritsejafor identified BH as a "theological problem," an "ideological problem," and a "jihadist issue." BH started with "mullahs, sheikhs...people who studied the Koran." "In the mosques," meanwhile, "there are things that are being taught that are not right." According to Boko Haram, "Islam must rule Nigeria" and Shekau had stated that "we will not stop until we create an Islamic state." Seeing the BH problem as a "religious ideology," Oritsejafor's solution was that "you must go to theologians." Oritsejafor calls upon these Muslim leaders to "sit down and break out your holy books" in order to develop theological responses to BH ideology. In this process, Orisejafor rejects any superficial, controversy-free dialogue with Muslims, in which people often afterwards think, "What did you just do: nothing." A willingness to "annoy" and "offend" is the "only way you can really get results." Religious sensibilities aside, Oritsejafor noted that some Muslim leaders are unsurprisingly "afraid" to challenge BH. "If you don't agree" with BH, "you are an infidel like me." After BH finishes with the Christians, it will turn to any Muslims not deemed sufficiently faithful and "will wipe them out." Oritsejafor and his associates called for the State Department to designate Boko Haram as a Foreign Terrorist Organization. That action, CANAN executive director Laolu Akande stated, would inhibit the finances of BH. BH is not just working with "chicken change," but has "fat pockets" backing. A designation, Oritsejafor added, also "sends a message that these people are terrorists" from a world leader. Nigeria's porous borders only facilitate BH arms acquisitions, allowing arms in from an instable post-Gadhafi Libya as well as from strife-torn Mali, with Islamist fighters coming from there as well. An October 2010 seizure in Lagos, Nigeria, of 13 containers filled with munitions such as rocket launchers linked to Iran, also indicates ready suppliers for groups like BH. Yet, even as parts of the American government have favored designating Boko Haram a terrorist organization, the State Department has refused to act. Its 2012 Country Reports on Terrorism, lists BH among the world's top 10 terrorist perpetrators, second only to Afghanistan's Taliban. A fact sheet distributed by the Jubilee Campaign, though, noted that five groups – Indonesia's Jemaah Anshourut Tauhid, the Middle East's Abdallah Azzam Brigades, Pakistan's Haqqani Network, Mali's Ansar Al-Dine, and Iraq's Al Nusra – have all been designated terrorist organizations since 2012, despite mounting fewer attacks. Ogebe dismissively explained State Department thinking that there are "good parts and bad parts of Boko Haram." Even as Boko Haram has avoided terrorist designation, the State Department designated Shekau himself as a Specially Designated Global Terrorist (SDGT) on June 21, 2012, with a $7 million reward on his head. "If he is a terrorist," asked Oritsejafor, "what about his organization?" Ogebe noted the "irony" that Nigeria helped the United States after the September 11, 2001 Al Qaeda attacks, but now the United States is "dragging its feet" on BH. In contrast, the "American government is funding a lot of things for Muslims in the north," Oritsejafor complained. American aid to Nigerian Muslim schools completed a "trifecta" of mixing mosque and state in education from three levels of government, Ogebe said. In addition to the international American aid, the federal Nigerian government funded 400 madrassas and Muslim religious education is required for all public school children in the state of Sokoto. Boko Haram victims, meanwhile, receive no relief from the Nigerian government, and have "personally paid their hospital bills," Oritsejafor said. "There are rich Christians. They should wake up." He appealed to "awaken the conscience to stop this genocide." Fadele similarly ended the press club briefing by asking the assembled journalists, "what will you do, what will you write." To Nigeria's suffering, "you may be the answer."